Automation Screen Automation you can afford…..
Are you upgrading your load out operation? One person can control the whole load out operation including blending. No additional computer hardware because we use the GMS-4000 system that handles the scale. Accidental product mixing is eliminated by limiting blend to bins with same material. No need for employee to be in the hazardous basement area. All equipment continuously monitored with audible alarms and automatic shut off, if limits exceeded. Unique ‘Volume Control’ allows blend to be run at slow speed to ensure correct blend and then throughput can be increased while maintaining the correct blend. We only use top of the line of the line equipment throughout the system for trouble free operation. All PLC I/O modules are pre-wired through wire ducts to terminal blocks mounted on din rails. Whole system is pre-tested before shipment. 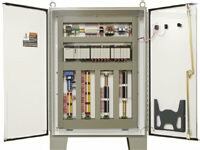 CompuWeigh control panels are UL approved for proper wiring and construction methods. Every facility is unique to some extent. However we have done so many automation projects that we have probably done one very similar to yours. We start with the base rail load out system and add and subtract components including adding modules like inbound dump pit control, enhanced hazard monitoring systems, gate control subsystems and supervisory control. We ensure that the PLC cabinet has plenty of reserve space so that the I/O can be double the base system and still fit inside the standard cabinet. We also offer a wide range of communication options. In addition to the built-in Ethernet we can provide DeviceNet, ModBus and DH-485 communication modules. We will send you back a proposal on what it will cost to automate your facility. Contact us.